UCU Left | Tories in crisis: General Election now! UCU London Regional Committee met on Saturday and voted unanimously to call on the TUC to call a national demonstration demanding a general election. The Committee met in the same week that the government had lost their motion on the Brexit deal and narrowly avoided a motion of no-confidence by 19 votes. It was an unprecedented defeat for the government. The biggest defeat suffered by any government in modern times. It has left the Tory party, the most successful ruling class party in history, even more divided and possibly heading for a split. Working people who are suffering from over a decade of austerity look on bemused and angry with contempt at the political elite – an elite whose members demonstrate every time they rise to speak in parliament just how removed they are from the experience of working people’s lives. The arcane rituals that surround the way these issues are debated and voted on may provide BBC commentators with glee and excitement, but they leave working people looking on in despair and wondering that there must be a better way to make decisions about how to run our society. The politicians and media present us with only two alternatives out of this crisis. Either we crash out of the European Union (EU) and sign up to the World Trade Organisation’s (WTO) trading agreements or we stay in the EU and abide by the single-market terms of trading. The alternatives we are offered are presented to us as the only possible ones. They reflect not the interests of the majority of working people but instead the two different wings of British business. The vast majority, whose business and trade are within the EU, want to stay in and the minority who have business interest outside the EU want to leave. Neither of these alternatives will make the slightest bit of difference to working people’s lives. Both would continue the assault on our pay, pensions, education and the welfare state. Neither will protect our hard-won gains over workplace rights. In fact, either option would make it harder to improve our conditions of life because neither are designed to do so. The WTO is a thoroughly corrupt organisation that pretends that it provides equal access to trading rights for both the poorer and the wealthier nations. Of course, the opposite is true. The WTO’s rules are completely rigged in favour of the wealthier nations at the expense of the poorer ones. The Trade-Related Aspects of Intellectual Property Rights(TRIPS) agreement is just one example of how the WTO ensures that the rich nations stay on top at the expense of the developing nations. The EU single-market is also a barrier to progressing the conditions of life for the 99%. The single market, just like the WTO, is a neo-liberal economic mechanism that ensures that the wealth created by working people is distributed ‘fairly’ amongst the employers at the expense of the real wealth creators. It also would make it much harder for a future Corbyn led Labour government to introduce a programme of legislation to re-nationalise the rail networks and public utilities as UCU’s Johnathan White argues in a recent article in the Morning Star. If both solutions being put forward by the elite will not benefit working people then we must put forward our own alternative. Jeremy Corbyn rightly argued In Wakefield this week that the main division in Britain is not between remainers and leavers. It is between those whose living conditions have been drastically eroded after a decade of austerity and those whose living conditions have not. 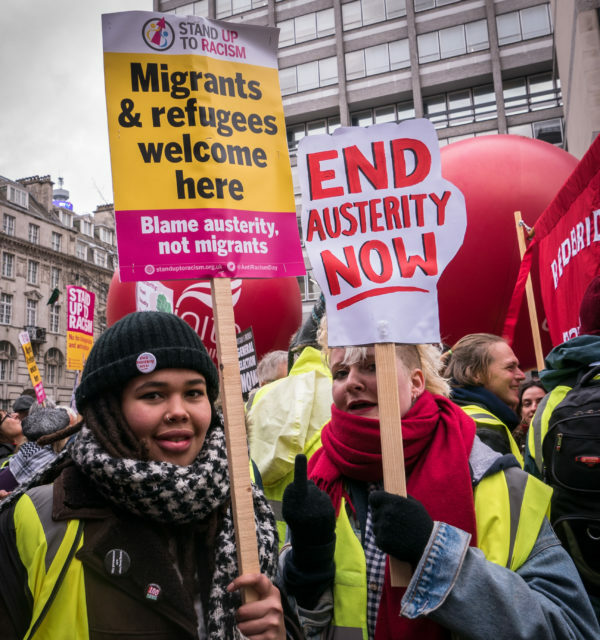 It is the neo-liberal austerity-driven policies of successive governments, here and across Europe, that are to blame for the poverty experienced by so many and the inequality that has risen from it. The only way we can begin to put this right is by electing a Corbyn led government with a radical agenda that ‘takes back control’ of how wealth is redistributed through raising taxes for the rich and an extensive programme of re-nationalisation. This is why, however you voted in the referendum, we all have an interest in uniting to get a Corbyn government elected. Of course, we will see how far the employers will allow JC to introduce such measures before they start to try to undermine a democratically elected government. I suspect they will give him a little less time than they are giving Theresa May at the moment! But first we must get him into office. That means calling a general election now. Mobilising on the streets and the workplace to break the impasse. The quickest and most effective way that we can break this impasse and shape an alternative to the binary debate between WTO versus the single market is through the mass mobilisation of working people. The only reason what Theresa May and the Tories are still in government is because the vast majority of working people look on, passively, as if they are watching a BBC period drama! The demo called by the People’s Assembly was a step in the right direction. But we need many more and much bigger initiatives. The TUC really must step up to the plate. It is utterly ridiculous that the biggest voluntary organisation in Britain with six million members has been almost completely silent while this crisis has been taking place. They must call a national demonstration. Campaigning organisations like the PA and Momentum must take more initiatives demanding a general election. It was a mistake not to call a protest outside parliament on the day of the no-confidence vote. Momentum have demonstrated that they can get thousands of their members on the streets when they want to, as they did when there was a second attempt to oust Jeremy. UCU members in 16 colleges will be taking two days of strike action on the 29/30thJan over pay and conditions with more to be balloted to join them in a third wave of action. In HE seventy thousand UCU members in 143 institutions are also being balloted over pay. We need more action like this if we are going to be able to protect workers’ conditions and build organisations that will be able provide the networks to ensure that a future Corbyn led Labour government is able to implement a radical anti-austerity programme. Please raise this motion at your next branch or regional meeting. 1) The Tory government suffered its biggest defeat in modern History. 2) The impasse in parliament over how to implement the decision of the 2016 referendum on the European Union. 3) Austerity continues to wreck working people lives. 1) The Tory government, and party, is wracked with division and self-interest and is not fit to govern. 2) That the main division in the country, as Jeremy Corbyn argued in a recent speech, is not between leavers and remainers; it is between those affected by austerity and those who are not. 3) We need a change of government that will begin to address the underlining problems that have created such fury and rage amongst working people in Britain – namely a complete reversal of austerity-driven polices. 4) The impasse that has been reached will not be resolved in parliament alone. It will take mass mobilisations on the streets and in the workplaces to break this gridlock. 1) To call on the TUC to call a national demonstration to demand a General Election. 2) To encourage UCU and other Trade Union branches to support this call. 4) To call a protest outside parliament on the 29thMarch and approach other campaigning organisations and trade unions to support. Thank you very much for this It has been circulated to the Greenwich and Bexley TUC members. Solidarity! Lynne Chamberlain, secretary, Greenwich & Bexley TUC.